When it comes to cast-iron cookware, one name rises above all others, and that name is Lodge. In every professional review, every forum discussion, and every consumer-review website, Lodge is not only the top-rated cast iron cookware across the board, but it's also considered to be highly affordable. 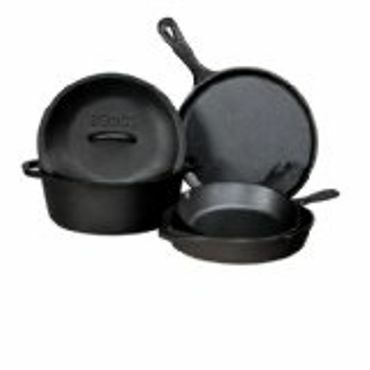 Like all cast-iron cookware, seasoning is required, but Lodge offers the option of buying its products pre-seasoned -- though even with pre-seasoned cookware, you still have to let the seasoning become well-established to get the full stick-resistant benefits of a perfectly seasoned cast iron pan. The Lodge website has detailed, but simple, instructions for properly cleaning and seasoning your pans. There are a few other drawbacks to cast iron, which is why there are other options, like stainless steel cookware and nonstick cookware. For one, cast iron is very heavy. There are people who simply can't use cast iron pots and pans because they can't wrangle them in and out of their cupboards -- especially the larger pieces. It also requires a bit more patience as cast iron takes longer to heat up and much longer to cool down than other types of cookware. Also, when it gets hot, the entire pot or pan heats up; when it comes to cast iron cookware, there's no such thing as a stay cool handle. Heavy-duty oven mitts are an absolute must. Still, most everyone has a piece or two of cast iron in their cupboard simply because there are some things that cook so much more superbly using cast iron. Cast iron cookware is also extremely versatile and can be used on any type of cooktop, in the oven or even on a grill or over a campfire. Very few other types of cookware can make that claim. Cast iron also lasts virtually forever. We saw hundreds of forum posts from people discussing their cast iron pots that once belonged to their parents, grandparents or even great-grandparents. Experts say if you can only have two pieces of cast iron, choose a small skillet for making corn breads and desserts such as cobblers, and a grill pan to use on top of the stove for searing meats. However, if you want to go the full Monty and make cast iron your go-to cookware for everything, check out the Lodge L5HS3 5-Piece Pre-Seasoned Cast-Iron Cookware Set (Est. $120). While many owners say they use cast iron only for specific tasks, plenty of others use them as everyday pans and say they are superb at even heating, although they may take longer to do so than thinner pans. Most owners also say they're easy to clean, and that seasoning is very simple to do. Quite a few customers do use these pans for kitchen cooking and for camping, and there are a number of happy customers who rave about how this cookware performs on the grill and in smokers. The few complains we saw were things that are simply a by-product of cast iron -- the heavy weight and the fact that they are not (and never will be) as fully nonstick as a true nonstick pan. This set includes a 10.5-inch round griddle, 8- and 10.25-inch skillet, 5-Qt. Dutch oven and 10.25-inch iron lid. Lodge also makes enameled cast iron cookware, but it's not sold in sets. Those products are also very highly rated on consumer review sites, and get particularly high praise for their attractive appearance. In addition to black, enameled cast iron comes in red, green, blue, orange, brown and purple. Some colors have more than one shade. While all Lodge products get great reviews for performance, a number of wise cooks point out that it's still a good idea to have one quality nonstick pan around for things like eggs, which don't cook well in a cast iron pan until it's been seasoned for quite a while -- which can sometimes take months or years. Still, if you have any interest in cast iron at all, as your primary cookware or as a supplement to nonstick or stainless steel, look no further than Lodge.